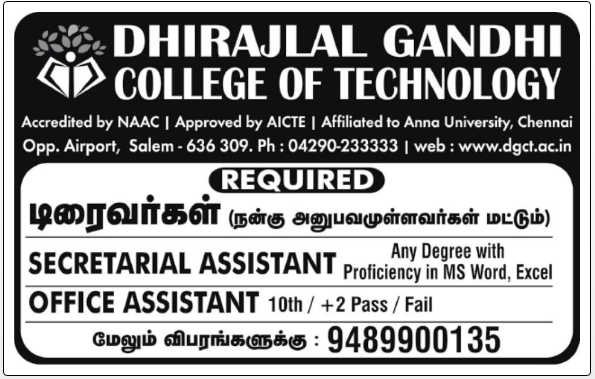 Dhirajlal Gandhi College of Technology, Salem has advertised in the DINATHANTHI newspaper for recruitment of Non-Teaching Faculty jobs vacancies. Interested and eligible job aspirants are requested to apply immediately from 20th January 2019. Check out further more details below. About College: Dhirajlal Gandhi College of Technology is to improve the quality of human life through advanced level programs in Engineering and Management that are internationally recognized for excellence and facilitate research work incorporating social, economical and environmental dimensions. How to Apply: Interested and eligible candidates are requested to send detailed resume along with copies of certificates and PP size photos to the email address given below or contact through phone.